I served a five year apprenticeship to the trade of carpentry and joinery in the late 1950's and early 1960's. I picked up a "City and Guilds of London Institutes" qualification as Carpenter and Joiner and a National Cert. in building construction before leaving my native Lancashire (England) to emigrate to Australia as a "Ten pound tourist". In my early twenties I had the qualifications to be a trade school teacher and a couple of my mates did just that. I chose an alternative path and started to work for myself first as a sub-contractor and later a builder. My wife and I started our own construction company in 1974 and we ran it successfully until I retired at age 65. We were full members of our Master Builders association for over 25 years. 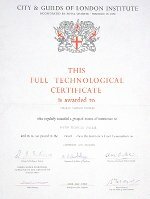 I started using computers in the early 1980's and was CAD drafting and submitting my own plans to the building department by 1985. My last building submission was in 2006. I consider myself first and foremost a practical person who loves to get in there and do it. At the same time I am always looking for easier or faster ways to do things. Many times when faced with a hard or a difficult job I have used the expression "there must be an easier way to do this" to myself. A lot of the material in my books is the result of finding those easier and faster ways of working. What you will get in my books are instructions that relate to the real world. Where the work has to be done in a quick and efficient manner. My website and the books are in some small way a means of passing on methods of working that I have worked for me over the last fifty years.